Add all ingredients to a high-powered blender (Vitamix is ideal) with 8 oz. cold water and a handful of ice. Blend for 2 minutes or until completely blended (i.e. no pieces of veggies or fruit are visible). Adjust the amount of water and ice for desired consistency and desired temperature. Get 1-on-1 help from your SANECertified Coach here. Jump to your awesome SANESmoothie FAQ here. Get monthly discounts on smoothie supplies here. *You can add two additional serving of veggies in place of the two TBSP of Garden in My Glass. If additional veggies are not added and if Garden in My Glass is not used , track 2 servings of veggies per smoothie (versus 4). **Only add protein if the smoothie is your entire meal (see TIP below). Vegetarians can use 6 TBSP Clean Pea Protein (versus Clean Whey Protein). ***To minimize sugar content, reduce fruit (other than lemon) and increase Slimming Sugar Substitute. If fruit is reduced by half or more, no servings should be tracked. Due to their extremely low sugar content, lemons should not be reduced and do not need to be tracked. Goal: Easily increase your veggie intake. Since the goal of these smoothies is *only* to increase your veggie intake, be sure to *exclude* any protein and fats in the smoothie's ingredients list. These "all veggie" smoothies are the perfect way to add veggies to a meal which already contains protein and fat. For example, drink one of these smoothies along with an egg (fat) and egg white (protein) scramble to ensure your breakfast is a Complete SANE Meal (veggies, protein, and fat). Also, these "all veggie" smoothies can be enjoyed throughout the day to help you easily reach your daily veggie servings goal. Goal: Quickly prepare a convenient meal. 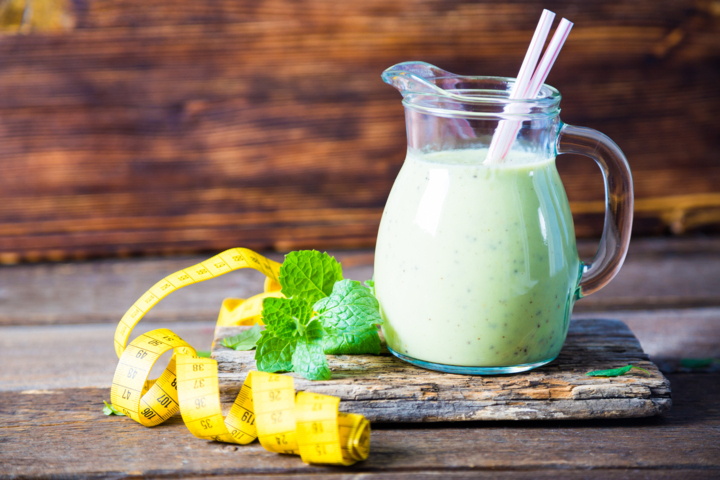 Since these smoothies serve as your entire meal, they should contain 2-5 servings of Non-Starchy Veggies, 1-2 servings of Nutrient-Dense Protein, and (if needed) 1-2 servings of Whole-Food Fats. The most delicious and effective way to add Whole-Food Fats to any smoothie is to add a serving of unsweetened shredded coconut or avocado, and then to blend as usual.